Language of Street - ZineWiki - the history and culture of zines, independent media and the small press. 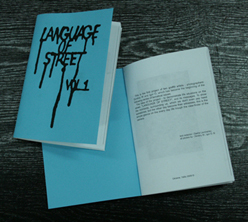 Language of Street is a zine by Dmytrij Wulfius and Igor Okunew. This is a 30 page zine released in Yalta, Ukraine in 2009. The cover is printed on blue paper and the contents of the zine are black and white photocopied pages. The zine is devoted to photographs taken by the editors. This page was last modified on 28 July 2010, at 20:40.